A curse had been broken and Meliodas and Elizabeth we're finally free from being forced to love each other and just like that a strange girl enters the tavern her powerful magic stunning the sins. "Y/N, that's amazing" He says watching me a dreamy look in his eyes as I blush. Read to find out :)! A request to my wonderful followers! 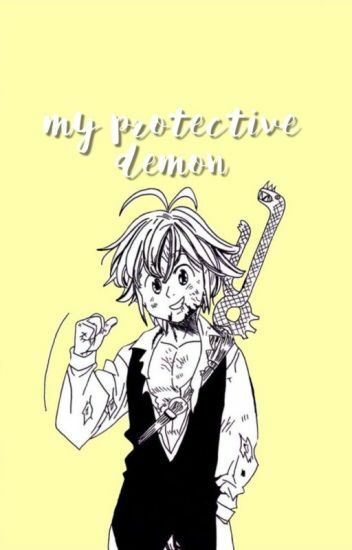 More Meliodas x Reader stories! You are an assassin to the demon king, who is best friends with Meliodas, son of the demon king who is now a traitor. When you are told to kill 'The Dragon Sin of Wrath', you don't hesitate to go to the human realm to find him. But is it who you expect it to be? This is my very first time writing my own story, I'm going to try my best to make it a good and well written story that will blow your minds! And I will try my best to update as much as possible! "Everything was suddenly getting blurry, my vision was off, and my body felt lifeless. All I seen was blood everywhere and all I could hear were screams. Then suddenly I felt a tear drop down my cheek. It took all my energy inside of me to turn and took upward to see the only one I truly loved. My eye lids started to shut, my body started feeling numb. Then I felt two hands pick me up bride style and my head lied against something warm. 'I hear his heart beat' I think to myself. I wanted to tell him before it was too late, so before my body was going to be sleep for good, three words was going to slip out of my mouth. but..... Only one did, and that one word took everything inside me to say, "Meliodas......" Then everything went black. As you all know Meliodas , the sin or wrath, the Captain of the Seven deadly sins, suddenly discovered there is a new and rare key to open up the gates of hell that he must find before the holy Knights do. Let's all pretend that all the holy Knights weren't after Elizabeth, they were after YOU! Y/N, the princess of the holy devil, the daughter of the king of all demons, that one and important key. And let's also pretend that all the seven deadly sins were never separated, they were all together traveling from place to place and that Elizabeth was part of the club the whole time. I know it's a lot to take in but just bare in with me. I would tell you more about the story but I want you to read it for yourself, but if any of you get confused just leave me a comment and let me know and then I'll explain it all if needed. Now no more with the chit chat, let's get started!!! somewhere in that forest, a nightmare is waiting. But something happened to her, that they must find out what. 1. I don't own anything of the seven deadly sins except Y/n, Chrissy and some other characters that aren't in the anime/manga. 2. Some sexual content since this a Meliodas X Reader so it's expected. Meliodas, the sin of wrath. Ban, the sin of greed. Gowther, the sin of lust. King/Harlequinn, the sin of sloth. And princess Elizabeth of Liones. These five have embarked on a journey to save the kingdom. They search far and wide for the two other sins, pride and gluttony. But what about the eighth sin, the sin of burden? Don't make the mistake of thinking she is a burden to the sins. That is not why she was given this name. She is the sin of burden because she always tried to handle everything herself. Not out of pride, but because she wanted to seem useful and make sure the others didn't get hurt. What will happen when this phantom sin joins her counterparts? Y/N: A little demon girl,you dont know your last name, you dont know where you came from you dont even know how you got here, you dont know who he is, but you know that you love him. (Y/n)(L/n) is moving back with her dad and will be going to Liones High where she meets a certain blonde haired sin and his friendly group of vampires . I do not own Nanatsu no Taizai, Netflx and Nakaba-Sensei do. Adventure awaits you, 8th deadly sin, wolf sin of vengeance , (f/n) (l/n). You were the dear friend of Meliodas and the other sins in the kingdom of Liones, before the kingdom had havoc wreaked over it. You were all summoned by the grand master to come to his office. You were all joking around, until you got to his door. Meliodas knocked, but had no answer. What you did not expect to happen, was the grand master of the holy Knights, hanging by swords and arrows on the wall, dead. The kingdom framed you, and banished you from the land as you split ways. Ten years later, you stumble apron a tavern, hoping for a drink to take your mind off of things. But the owner of the tavern, was no other than the captain, Meliodas. Help Meliodas and Elizabeth along on there journey to find the other 6 sins, while trying not to fall in love with Meliodas again. For that may be, your second sin.